Therapeutic and relaxing massage combined with deep heat therapy delivered through the use of polished Basalt Stones that have been heated in hot water. Larger stones are used as placement stones to relax tense areas before the body work begins while smaller stones are held in the hand to deliver warm massage strokes of varying pressure to the entire body soothing aching muscles, seeking out knots, and easing away stress. 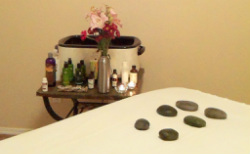 Hot stone massage allows the therapist to blend their skills with the natural energy of the stones. The addition of moist heat induces a deep relaxation in the muscles which means that where required, deep tissue work can be done more effectively. Who can benefit from a Hot Stone Massage? It is a massage technique that may induce a very deep sense of relaxation. Hot stone massage is also a really good treatment for clients who feel the cold! During the winter months it will warm up the body quickly and because the heat relaxes muscles it will allow for therapeutic massage without using an uncomfortably deep pressure.